There is a famous western medicines say, “An Apple a day keeps the doctor away”, in the same way Ayurveda have its own saying “Eating a banana will keep you away from all diseases”. Compare to apple banana have four times more proteins, five times vitamin A and iron, three times the phosphorus, two times carbohydrate and twice other vitamins and minerals. This golden fruit of tropical regions contains all the essential nutrients needed for health. This fruit is known to be a store of vitamins, minerals and carbohydrates. It contains vitamins A, B, B-6 beside calcium, magnesium, iron, potassium etc. Raw bananas contain about 20 to 25 percent starch. Then during the maturation process the starch is almost converted with assimilable sugar. Ayurveda is one of the world’s oldest holistic healing systems based on the five basic elements of nature that influence the three humors (doshas) of the body. Ayurveda recommends banana as the first solid food for babies. The yellow skin Banana can cures most diseases caused by the three humors (vata, pitta and kapha). Although it balances vata and pitta doshas it may increase kapha dosha if not properly digested. An interesting feature is that bananas can reduce your weight causes obesity and at the same time it can build the body. Ayurveda also recommends feeding of banana to anemic children. 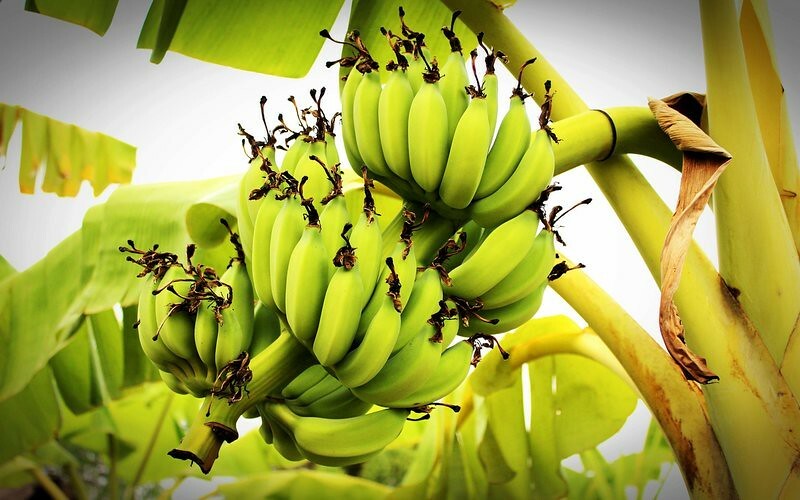 According to the Ayurveda texts such as “Sushruta Samhita” explain the benefits and uses of banana tree that can be used as both fruit and vegetables. They note that the banana is only the plant whose stem, flower, leaves; skin means whole plant is full of medicinal properties. It also keeps the body cool by balancing the vata and pitta dosha. When harvesting bananas the tree so called stem is cut away. The tender inner part of the stem can be used as vegetable. The stem are very fibrous so it is necessary to clean the fiber yarn properly .The stems are cut into a smaller pieces and soaked in buttermilk or diluted yogurt for half an hour and can be consume. In southern part of India it is cooked as a vegetable and eaten with rice.The banana stem are of rich fiber so it very beneficial for those people with a weight loss program .In addition it have good amount of potassium and vitamin B6 that helps in the production of insulin and increase hemoglobin . It is also beneficial to a person having blood pressure.Eating banana stem once a week will keep blood pressure under control. It also helps to maintain fluid balance within the body and detoxify the body. In southern part of India using banana leaves in daily life have a traditional look they serve food in banana leaves. For them Banana leaf is considered a sign of purity and therefore people consider big meal to be served in a banana leaf. The medicinal benefits of banana leaf juice is that it is an amazing cleanser. Banana peel or so called skin is rich in polyphenols and carotenoids that are phytochemicals with antioxidant properties. The Studies have found that unripe banana peel contains more antioxidants properties than ripe banana. The other antioxidant properties found in banana peel is ‘lutein’, which is known to reduce oxidative stress and neutralize free radicals in various parts of body including the skin. The ‘lutein’ found in banana peel is also known for providing nutritional substance to eyes reducing the risk of macular degeneration and cataracts, filter out harmful UV rays which damage the eyes and protect cells in the eyes from free radicals damage . The researchers suggest a minimum of 6 mg – 10 mg of ‘lutein’ is required daily to be healthy and fit that can be obtained from dark green leafy vegetables, spinach and fruits, so why not from banana peel instead of throwing it away. Banana is used as traditional medicine in India and the ancient Persia it is called the golden fruit due to the secret of perpetual youth nature. Today banana is known to consume for the healthy digestion. It create a feeling of youth as it have calcium , phosphorus and nitrogen all of which then work to build sound and regenerated tissues. Below is some more benefit of eating banana and banana tree uses. Banana fruit have low protein and salt and are rich in carbohydrates that are useful to person having kidney disorders. It is also useful in different aliments such as uremia, a toxic condition of the blood cause due to kidney congestion and dysfunction. In such cases bananas must only being taken for three to four days, the consumption of bananas is eight to nine per day. The banana are suitable for all persons with kidney problems, including nephritis . Note: The person suffering from kidney failure must avoid it as it have high content of potassium that can harm kidney. The banana stem juice is a well-known remedy for urinary disorders. It improves the functional efficiency of kidney and liver thereby reduces the pains and diseased condition in them. It clears the excretion organs in the abdominal portion and helps to eliminate toxins in form of urine. It has been found that it is helpful in the treatment for removal of kidney stones, gall bladder, and prostate. It is advisable to mix this juice with the juice of ash gourd for best result. The banana fruit is very useful for those people who are allergic to certain foods causing a result of skin rashes.It is also useful in aliment such as digestive disorders or asthma. Unlike many other protein-rich foods they contain an amino acid which the people cannot tolerate and causes them allergy. But bananas contain only benign amino-acids that are not allergic. Even though it may not causes allergic reactions, but in some individuals who are allergic should avoid it. Bananas is well known remedy for both constipation and diarrhea it normalize the functions of the colon in the large intestine to absorb large amounts of water for proper bowel moments. It is beneficial in constipation due to its richness of pectin that functions as water absorbent and gives them greater production ability. It functions to change the bacteria in the intestines from harmful type bacilli to beneficial acidophilus bacilli. The uses of Banana flower is known to be best natural remedy for menstrual disorders. If it is taken with curd it is very useful for menstrual disorders such as excessive menstrual bleeding and pain. Banana flower helps to increase progesterone hormone which reduces the bleeding. Precautions : Banana should be consume only when it is fully ripe or else it cannot be digested in the small intestine, which then fermented in the large intestine , often causing wind problem. Bananas should not be stored in a refrigerator as it prevents it from ripening. The person suffering from kidney failure or kidney related problem must not consume banana as it has high content of potassium that is unhealthy for such person. Thanks for bringing out such a great useful Article..
Banana peels are the best remedy for whiten teeth; it is nature’s amazing wonders as it is rich vitamin and mineral’s content in them. So next time if you eat a banana, don’t throw away that skin. It’s great to have your kind of person among us that has valuable knowledge and enhance it by sharing with others, thanks a lot regards by vikas.